Inspiration Photo Credit : Examples and unfinished pumpkins from the junque-2-jewels website. We will be purchasing the unfinished pumpkins from her shop. Register quick for this one! Only accepting reservations thru Wednesday, September 12, 2018 in order to adhere to the processing/shipping deadline from the wood shop! 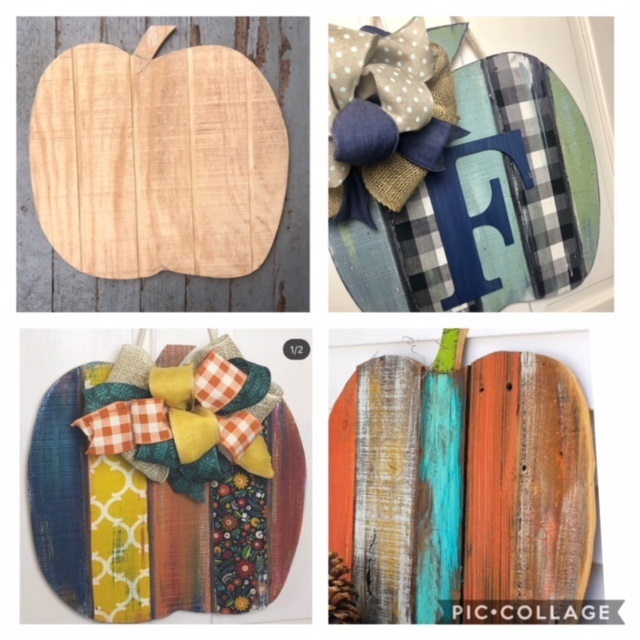 Project supplies include: 18″ X 18″ unfinished wooden plank pumpkin, a variety of paint, napkins, fabric and scrapbook paper, mod podge, hanging wire/ribbon. Initial optional. Register for September’s Wooden Planked Pumpkin. No to-go kits are available! RSVPs and cancellations for this craft are due by Wednesday, September 12. If you need to cancel after this date, please let us know and we will email you an invoice only for the pumpkin, and set up a time for you to pick it up. *$1.50 added for Square payment.